Everything’s good but the noodles rule in Pannda House. 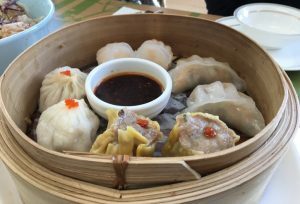 Heading over to The Grove for lunch at Pannda House last week, I recalled how we’ve always had great Chinese restaurants in South West Sydney. 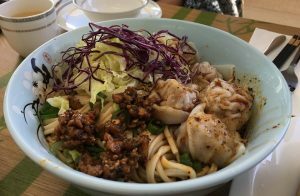 Places like Liverpool’s legendary Hong Kong Palace in Northumberland Street and the House of Bamboo in Queen Street, Campbelltown meant we never had to leave our neighbourhood for a brilliant Chinese meal. No long drives to Chinatown for us, and in those days before motorways like the M5, it really was a big trip to get into town, even in the off peak of an evening. Of course we are still blessed with places like James Chan’s Canton Village at the Crossroads or Casula if you prefer. Down south Tony Chan’s Teahouse in Minto is still going strong after more than 30 years, as is the Pink Diamond in Blaxland Road. But there’s always room for one more great Chinese restaurant, and the Pannda House fits the bill. The décor, apart from what some may consider kitschy chairs, is inclined to the minimalist, but the food more than makes up for it. The service is quick, and friendly, but the hero of this place is the noodles, which are made on the right hand side of the open plan kitchen. And when the food arrives, which it does in a good time, the noodles rule. They taste super fresh, because they are, and what’s even better, there so much of them two of us ended up taking the leftovers home in a very modern takeaway bowl. There was no way any of us would have left without them, they were that delicious. We also ordered one lot of dumplings to share, and they also were delicious. 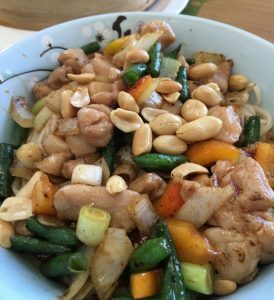 We had chicken and beef and vegetables with our noodles, and we agreed that they all tasted excellent. 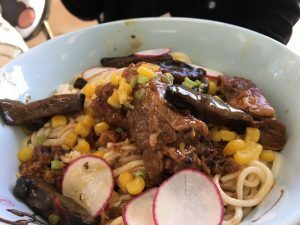 And we also agreed to use our noodle and return to Pannda House as soon as possible to try more of their delicious fare – with more noodles of course!